Lady Mura is a 29m Dominator built in 2010. 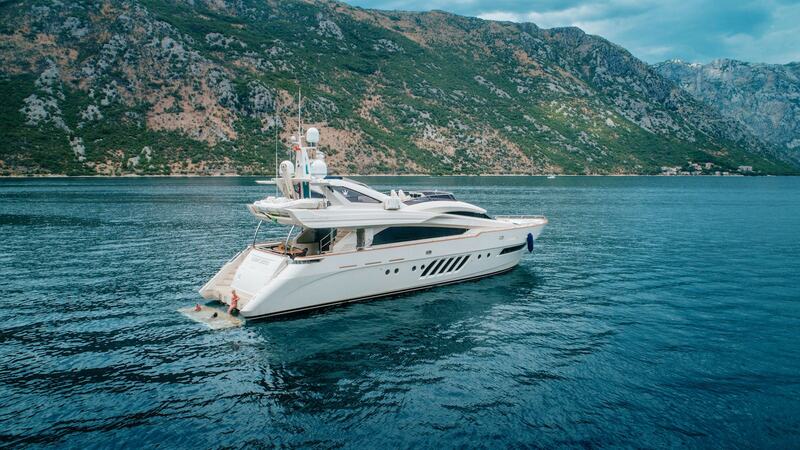 This modern and sleek yacht accommodates up to ten guests in five cabins, along with a warm and welcoming crew of six that will ensure an unforgettable stay while cruising in the Mediterranean. The yacht’s interior decor is contemporary and warm, creating a harmonious ambience. Her large salon features elongated side windows that provide ample natural light throughout. All five cabins have private en-suite facilities and are fully air conditioned. Her exterior living areas are well-appointed on two levels. Aft of the salon, a sliding door leads to a shaded alfresco dining area, which is a favorite social area among guests. The foredeck has a large seating area with a pop up Bimini cover, hot tub and sunpads while on the upper deck, the yacht features a massive sunpad, wet bar, retractable TV, BBQ station, alfresco dining and optional shade.